Perform emergency treatment guidelines. Because of the severity, almost all cases of type IV fractures will be treated by the dental officer. Only in very rare cases, will the Dental Technician provide treatment. In such rare cases, the dental officer might authorize the DT to place a splint in the same way as for the type III fracture. If a tooth has been traumatically extracted from the socket, notify the dentist as soon as possible. The dental officer may instruct you to replace the tooth back in the socket after rinsing it with sterile saline. Time is of the essence for the replantation to be a success. Perform emergency treatment guidelines and control hemorrhaging until the dentist arrives. The dentist will treat this type of injury. Your responsibility is to prevent further injury and to lessen the pain while waiting for the dentist. A person who has a fractured jaw may suffer serious interference with breathing. One of the most important phases of emergency care is to clear the upper respiratory passage of any obstruction. Fractures are usually the result of a high-velocity accident (e.g., the face striking the dashboard of a car). Of all the facial bones, the nasal bones, followed by the mandible, are the most frequently injured. Less common is a fracture of the maxilla. It can be distinguished from a mandibular fracture because the fractured maxilla will cause severe malocclusion consisting of an open bite. The face will also look elongated. Both the mandible and maxilla fractures are treated in the same manner until a dentist arrives. Figure 6-8. 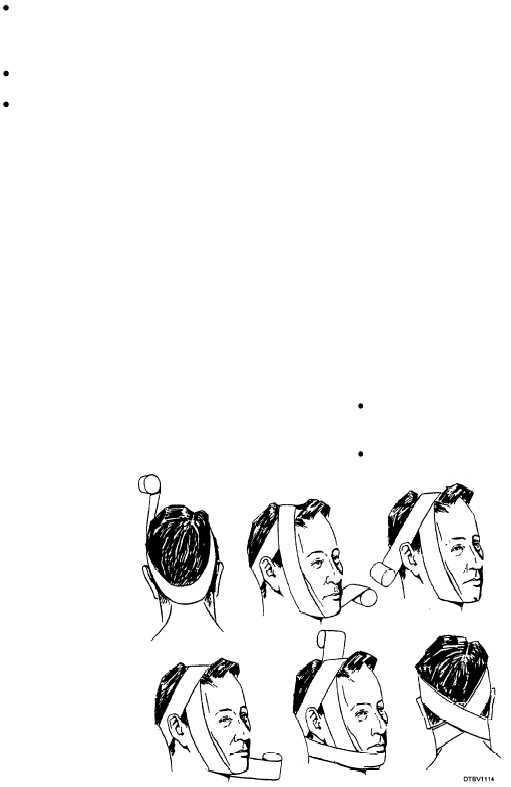 - Bandaging to immobilize both mandible and maxilla.